Welcome to Cub Scouts, Fun with a Purpose! This parent guide will provide you with answers to questions about Pack 100’s cub scouting program. It will contain information about pack policy, meetings, awards, uniforms, activities, costs, and your role within the Cub Scout organization. If you have any questions please feel free to contact your son’s den leader or cub master for more information. Who are all these people and where do they come from? The Boy Scouts of America was founded in 1910, and became federally chartered with the United States in 1916. The Cub Scouts was started in 1930. Millions of scouts have worn the uniform, cooked over an open fire at a campsite, earned their Bobcat badge, raced their Pinewood Derby cars, worked on service projects within their communities, and made many new friends as part of the Scouting organization. Throughout all this fun and excitement is a character-building program that encourages scouts to make good ethical choices, strengthen family bonds, improve physical fitness, and develop citizenship skills. Pack 100 is primarily made up of boys and girls and their families who are within the boundaries of the Centennial Elementary School district. Our pack is chartered by the Centennial Elementary PTO and is led by the Pack 100 Parent Committee who plans and organizes the yearly pack activities. All of our leaders are volunteers consisting of parents and relatives of the cub scouts. Our pack depends entirely on the planning and participation of parents who make up the leadership and who help support scouting activities throughout the year. Organizationally speaking, our pack is in the Frontier Trails District of the Northern Lights Council of the Boy Scouts of America. A cub scout is a boy or girl who is in kindergarten through 5th grades or between 5 to 10 years of age. In Cub Scouts it is all about learning new skills and having fun. The scouts will learn, among other things, how to tie knots, shoot a bow and arrow and BB gun, construct a pinewood derby car, set up a tent, build a camp fire, and the best way to roast a hot dog or make a smore. They will be coached in decision making skills, ethics and morals, and will gain a sense of pride by helping the community through service projects like “Scouting for Food”. The Cub Scout program also puts an emphasis on family through the many opportunities scouting creates for you to get out and do things together with your Cub Scout. Good question! Our pack will usually meet at the Centennial Elementary School gym at 6:30 pm on most Sundays throughout the school year, unless otherwise stated on the yearly pack calendar. Your scout will be a part of a “Den” which consists of children in their own grade level and they will also be a part of the “Pack”. Den meetings usually last for about an hour and while there the scouts will work on achievements from their Cub Scout Handbooks. Each level of Cub Scouts will have a specific handbook from which to learn various age appropriate scouting skills and values. Scouting teaches family values and works to strengthen your relationship with your son or daughter by adding value to the time you spend together. It also teaches values consistent with good citizenship, character development, and physical fitness. What can you tell me about Cub Scout meetings? Parents are encouraged to participate in our Cub Scout meetings throughout the year. Everybody has some special skills and abilities that can be of great help to the Cub Scouting program. At a minimum, there is usually one den meeting and one pack meeting per month. The dens will meet together either at the school or at another predetermined location to conduct a meeting and to work on achievements. At least two adults are required to be present at each den meeting. This is called two-deep leadership. The dens may want to go on a field trip such as a visit to a police station or fire department. These activities are arranged with the den leader and parents. The parents and den leaders may also plan for additional den meetings throughout the year. Pack meetings are a gathering of all the dens of Pack 100 and parents for group/themed activities such as Pinewood Derby, Rain Gutter Regatta, Blue and Gold Banquet, or other fun activities. Throughout the year there are also District Events. These are special activities where Cub Scout packs from within our scouting district come together for activities. The district hosts Day Camps in the summer, Pinewood Derby warm up events in the fall, Winter Fun Days in the winter, and provides educational opportunities for our leaders in the form of monthly District Round Table meetings (first Thursday of every month) and the yearly University of Scouting event. There is also a parent meeting once a month (usually the Sunday following the District Round Table meeting) where the parents all get together to plan our pack activities, discuss organizational matters, and to exchange ideas. Pack 100 follows a “Scout year” of September to May and upon nearing the end of the school term, all the boys cross over into the next rank at our annual Pack 100 Crossover Picnic. During the summer months the pack participates in various day camps, summer camps, and other scheduled summertime activities. A full yearly schedule of all pack meetings and events can be found on the Scoutlander website or obtained from your son’s scout leaders. How can my son earn awards and patches? Each Scout must “do their best” to fulfill and complete the requirements outlined in his handbook so that they may earn their rank badge. After receiving their badges, the Scouts can continue on to earn other awards by completing a variety of electives. There are lots of awards and recognitions in Scouting, and Pack 100 makes every effort to ensure that these are earned through significant, meaningful methods that your scout will remember for a long time. These awards will instill in the scouts a sense of pride and accomplishment, which is evident by their smiles every time they receive an advancement. At the Lion, Tiger, Wolf, and Bear ranks, Cub Scouting centers on monthly themes. During den meetings, the boys will be playing games, building craft projects, learning songs, and developing skills. They will also be learning how to get along with others, becoming more resourceful, and participating in new activities. At the Webelos and Arrow of Light levels, the boys are introduced to a variety of Activity Badges. They work on completing these badges to earn their Webelos and Arrow of Light badges and to prepare them for entering Boy Scouts. The Webelos den primarily work towards earning their Webelos badge. After which, they will continue to earn additional activity badges and gain new knowledge and skills. The Arrow of Light Den, though maybe still earning Activity Badges, also begin focusing on completing other requirements to earn the Arrow of Light award (which is the highest award earned in Cub Scouts). They also participate in a variety of activities with various Boy Scout Troops from around the area. 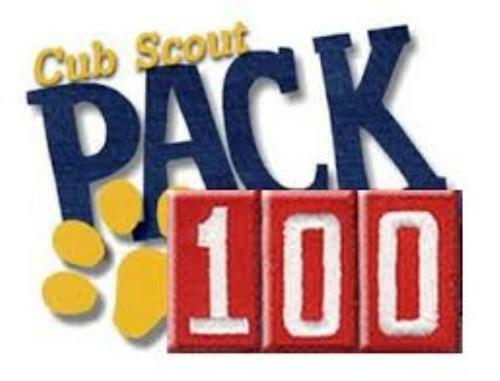 What are some of the pack activities that occur within Pack 100? In the past we have had: Pinewood Derby Races, Space Derby Races, Pop Bottle Water Rockets, Track and Field Days, Chariot Races, Cub Mobile Races, Pack Camping trips, Scouting for Food and other service projects, hiking trips, and Blue and Gold Banquets. They Lion scout will wear the Lion t-shirt. 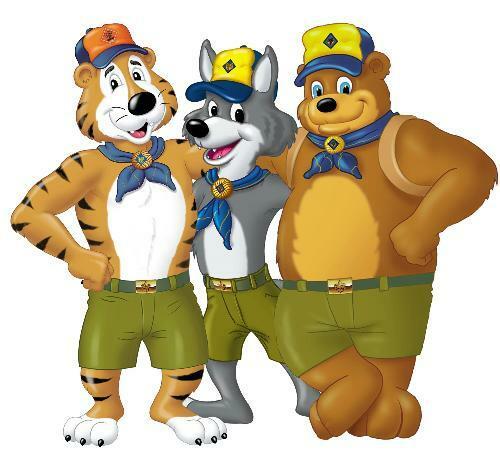 The Tiger, Wolf, and Bear dens wear a blue uniform shirt, blue pants, and a neckerchief in the correct color: orange for Tigers, yellow for Wolfs, and blue for Bears. The Webelos wear either the blue uniform shirt or the khaki uniform shirt, which is the same one the Boy Scouts wear. They also wear the Webelos Neckerchief which is yellow, blue, and red plaid. The blue and yellow is to remind them they are still in a Pack and the red is to remind them they will be moving to Boy Scouts soon. The Cub Scout uniform is an important part of being a Cub Scout. It is a symbol of equality, identification, achievement, and commitment. Even though each scout is different in their own way they are all Cub Scouts and come together and cooperate as equals. The uniform is highly recognizable to members of the community and is associated with being a good citizen. It also helps to identify which den, pack, and council each Scout belongs too. When a Cub Scout advances in rank or completes an achievement they are awarded either a patch, pin, or belt loop that can be worn on the uniform. These embellishments impart a sense of pride and achievement for the Cub Scout. Cub Scout Uniform Shirt—the shirt is available in either long or short sleeves, but most of the boys of Pack 100 choose to wear the short sleeve uniform shirt because it is more comfortable in the summer months. The Tiger, Wolf, and Bear Dens wear the blue colored shirt and the Webelos may wear either the tan or blue shirts. Belt—Official blue web belt with corresponding metal buckle in either the Tiger Cub, Cub Scout, or Webelos Scout emblems. Neckerchief—Triangular neckerchief is orange with blue trim for Tiger Cubs, gold with blue trim for Wolf Cub Scouts, light blue with blue trim for Bear Cub Scouts, and plaid for Webelos Scouts. Official BSA neckerchiefs are the only neckerchiefs boys should wear and Packs should not make their own pack neckerchiefs for the boys to wear. Neckerchief slide—Official metal slide with the Tiger Cub, Cub Scout, or Webelos logo. Boys may wear handmade neckerchief slides. When a child first joins Cub Scouting, their uniform will display only those badges that identify their status: the World Crest, the United States flag, Northern Lights Council strip, the red Pack “100” patch, and den number. In time, as the Cub Scout progresses he will earn badges, pins, medals, and other insignia that tell of his accomplishments. These items should be added to the uniform only after they have been earned. For guidance on the proper placement of all badges and insignia please ask any of your son’s scout leaders for guidance. You may also refer to http://www.scouting.org/scoutsource/Media/InsigniaGuide.aspx for a convenient guide for patch and insignia placement. When can my child wear their uniform? Every Cub Scout should wear their uniform to all Cub Scouting activities, including den and pack meetings, unit outings, and any activities done with members of the den or pack. When playing sports, going to camp, or participating in other physical activities, the pack may opt to have the Cub Scouts wear an alternate uniform, such as an activity shirt or Class B uniform t-shirt. The Pack leaders will provide advance notice of any occasion when the boys should wear anything other than the complete uniform. Pack 100 has Class B uniform t-shirts available for all boys and adults who would like one. Where can I buy my scouts uniform? You may consider purchasing your scout uniforms from the Fargo Scout Shop or placing an order online form Scoutshop.org. At a minimum, each scout should have a Cub Scout uniform shirt (short sleeve), patches (purple World Crest, Northern Lights Council strip, red 100 pack number), neckerchief, neckerchief slide, blue web belt, and a Cub Scout handbook. The uniform should be worn with any dark blue pants, preferably blue jeans. If your son or daughter is starting out as a Tiger Scout then you may want to purchase the uniform shirt a few sizes too big to allow for room to grow as your son progresses to Arrow of Light. Lion scouts may purchase the Lion t-shirt. There sure is a lot of fun things going on at Pack 100, but how much does it all cost? There is an initial expense in purchasing the uniform, handbook, and national/pack dues. Boys Life Magazine Paid for by Pack 100! Pack 100 participates in the Trails End popcorn sale which occurs every fall and an optional Spring Sale. Will I have to volunteer? When your scout earns their Bobcat badge they learn the Scout Law. One of these laws states “I promise to do my Best”. Throughout the year there are many activities and functions. Ambitious as they are, a Cub Scout still needs your help in implementing the program and thereby giving us the chance to keep our Pack strong and healthy. Remember, the Pack is all of us working together... leaders, parents, and Scouts. Unlike other programs your child might enroll in, Cub Scouting involves the whole family, no matter what size or parental make-up exists in the home. In Lions and Tigers, you are your Adult son’s and daughter’s Partner. In Wolves and Bears, you are Akela, the wise leader of the tribe of Webelos, and the final judge of your scout’s efforts. At the Webelos rank, you are the Activity Badge counselors. Throughout the year you may be asked to assist on different committees and at different events. Please volunteer freely and give of yourself when called upon to help. You will find it a rewarding experience, and one in which you and your scout will remember that you did it together.